Ferrets aren’t for the faint-hearted. Sociable, inquisitive and playful, they can make terrific pets. However, those same traits also make them accomplished mischief makers. Cousins of the the European fitch or polecats, ferrets are members of the weasel family and were used as vermin hunters for centuries. In time their talent became the basis of a rabbit-hunting sport known, reasonably enough, as ferreting. Independent streak – Such an active background probably explains their need now for several hours of freedom every day. (If they don’t get enough exercise, they become depressed or unsociable and hard to manage.) While they’re playing around outside their cages, someone should be keeping an eye on them to make sure their natural mischievousness doesn’t result in something being destroyed. Their hurting themselves. Or disappearing. The ferret’s earlier history of squeezing through the tightest of openings while chasing assorted vermin has turned them into accomplished escape artists. As well as keeping your ferret caged when you’re not around, you should also give it a collar with a bell. You should ferret-proof your house. This means blocking all holes, air ducts and spaces under appliances like fridges and washing machines. Preventing access to bins, cupboards and closets, drawers and toilet bowls. Plus putting plants out of reach. If you overlook an escape hole or alternative haven, be assured that your ferret won’t. If it makes it outside, the chances of survival are pretty poor. As you can see, compared to dogs and cats, ferrets are definitely high-maintenance. Speaking of which, ferrets get along with most dogs and cats as long as they’ve been socialised early. Even so, you should always supervise any interaction. And it’s best to keep ferrets away from pet birds, rabbits, guinea pigs, mice and rats. 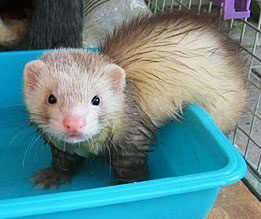 Some other characteristics – As carnivores (meat eaters), ferrets should enjoy their normal life span of five to eight years on a diet of premium quality cat food and/or ferret food. A pregnant female (jill) gives birth in around 42 days to young kits, which are born deaf and with their eyes closed. At about three weeks, their eyes open and they start to walk. Weaning onto kitten or ferret food should take place by the time they’re six weeks old. 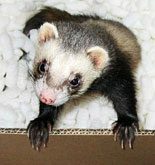 Ferreting out your ferret – You have three choices for sourcing a pet ferret: pet shops, breeders or ferret clubs. If you want to be like most other ferret owners, you’ll choose the polecat colour scheme of buff coat with black markings on the face, feet and tail. 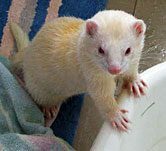 If you want something different, there are also ferrets that wear buff coats with lighter markings as well as albino ferrets complete with pink eyes. The first check-up – Within 48 hours of getting your new pet, you should bring it to us so we can check for any diseases and advise you on diet and housing. If you also bring a faecal sample, we’ll examine it for worms. We’ll also set up a vaccination program; ferrets should have shots at eight, 12 and 16 weeks of age against canine distemper, which is fatal with ferrets. Once a year your ferret will need a booster shot and a checkup. When it reaches five years, we recommend a complete geriatric work-up in order to detect heart disease and/or cancer, both of which are commonly seen in older ferrets. Desexing and descenting – Unless you’re planning on breeding, jills should be desexed prior to the onset of first oestrus. This is because female ferrets will remain in heat unless mated, and high levels of oestrogen for any length of time can lead to uterine infections, bone marrow suppression, even death. We also recommend desexing the males (hobs) both to control aggressive territorial behaviour and to reduce their musky odour. Descenting is unnecessary; it provides little additional benefit. To one degree or another, you will always be aware of the presence of your ferret. Housing – The first consideration is temperature. Because ferrets are overly susceptible to heat stroke, you should ensure their living space is well ventilated and the temperature doesn’t climb above 26°. Next, as indicated above, the cage should be secure. It can be made with a basic metal or hardwood frame covered by wire mesh, but there’s nothing stopping you from adding extra levels by using wire mesh, shade cloth or wood, linking everything by ramps or flexible pipes. You could even buy one of those fancy manufactured cages like the one to the left. 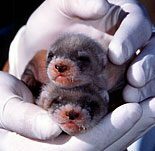 Whatever you end up providing, it should be no smaller than two metres square, which will comfortably house two ferrets. And, if placed outdoors, say on a verandah or balcony, it will need a solid sloping roof. Sleeping quarters. Ferrets appreciate a separate place to sleep. A plastic or wooden box will do fine. (You can even use an old shoe box as long as your ferret doesn’t start chewing and swallowing bits of it.) The bedding can be nothing more complicated than old clothes or pieces of blanket. You could also use straw, but shavings and sawdust are a bad idea. Other facilities. The feeding area should have a solid floor to keep food from slipping through. You can use heavy ceramic bowls that can’t be tipped over for food and water. Alternatively, you could train your ferret to drink from a water bottle attached to the cage. It will also need a small tray in one corner for urination and defecation. Praise and rewards are all that most ferrets need when being trained to use the tray. Naturally, it should be cleaned regularly. In less practical but just as mandatory terms, ferret also need toys. While there are special ferret toys available, you can also use hard plastic toys, ping pong balls, golf balls and those flexible pipes you find in the plumbing or gardening sections of hardware stores. But avoid rubber toys that your ferret can easily chew and swallow, possibly causing intestinal obstruction. The more the merrier. Ferrets love company, especially when young. While some owners house their animals in groups during the non-breeding season (December to July), such separation isn’t generally necessary; most desexed ferrets get along well together. One final suggestion. Training your ferret to come to you at the sound of a squeaky toy can come in very handy for those times it goes missing, most especially if it escapes outside.